FluidMotion is the exclusive provider of BOGAFiT and BOGAYoga classes in the Pittsburgh region. 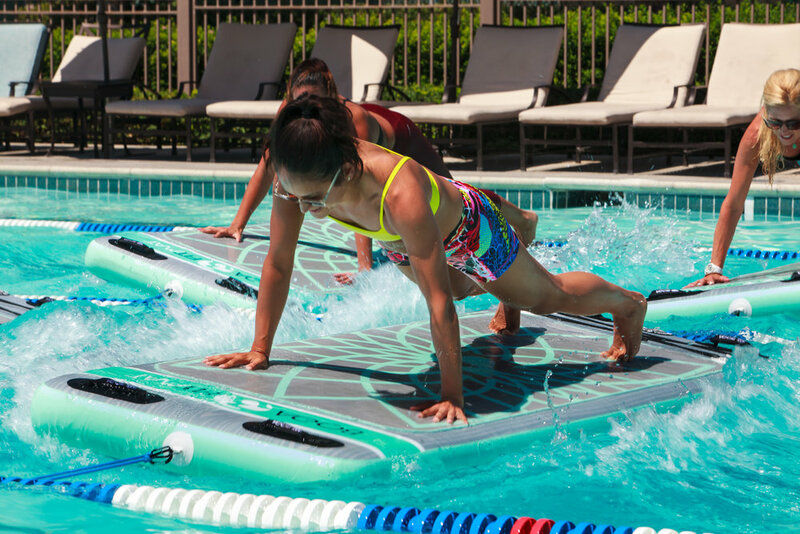 The FiTMat is an aquatic floating fitness mat made specifically for pools. BOGAFiT is a fitness regimen developed by combining the best aspects of key proven core movements from yoga and boot camp type workouts to rehabilitation and kids classes. 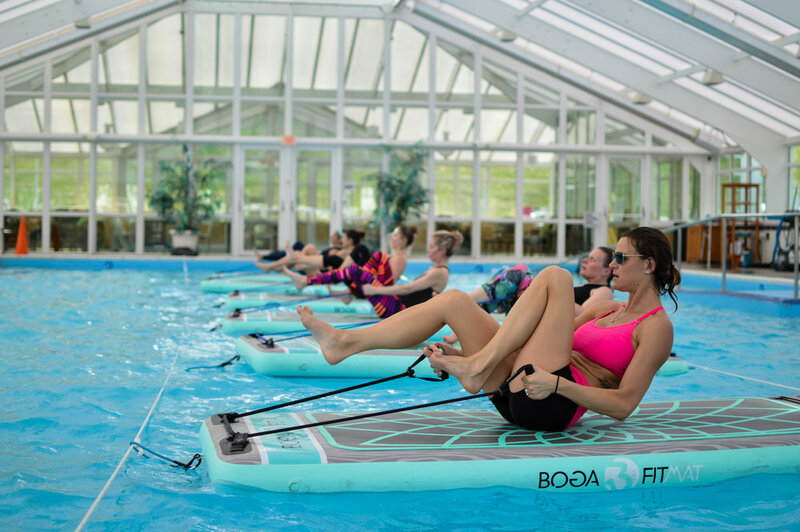 BOGA’s unique FiTMAT provides the Aquatic Base that intensifies these movements, creating focus on core muscle groups and improving balance and coordination. While BOGAFiT provides challenges to even the most fit individuals, the program was designed for universal scalability, making it the perfect fitness program for all levels, regardless of experience. Since FiTMAT provides a dynamic base, the harder you work, the more difficult and intense the workout becomes. It's unlike any other class you have participated in before! Our BOGA FiTMAT classes are a unique blend of isometric and plyometric exercises that are designed to keep your core strong while increasing flexibility and functional movement. Amplify your fitness to the next level and leave your comfort zone behind. Challenge your foundation, balance, power and endurance with the instability of the BOGA FiTMat and the unpredictability of the water in this unique class. This all-inclusive, high intensity interval training (HIIT) session will combine cardio, strength, flexibility, and balance into a fun total body workout. We will blend isometric and plyometric exercises like planks, push ups, burpees, lunges, squats, water-climbers and on-board sprints to get the blood pumping. A SUP Yoga cool down will stretch it out and bring you into a state of total bliss before settling down for a sweet sunny savasana. Leave your ego on shore and be prepared to get wet. See when classes are offered. Blending the benefits of High Intensity Interval Training (HIIT), Yoga and Pilates into one 60 minute total body workout that will focus on elements of fitness: cardiovascular, muscular conditioning, flexibility and balance! You will leave empowered and feeling strong. The water creates a peaceful atmosphere yet challenges your balance in an entirely different way. You will feel the subtle body awaken and your mind body relationship quickly shift. You will get acquainted with the FiTMat by learning how to align your body to evenly distribute weight and create balance. Once acclimated to the unpredictability of the water, we will heat things up with a high intensity interval training (HIIT)/low impact workout to get the blood pumping. This class accessible to everyBODY! A short yoga cooldown and sweet savasana sets everything right for the day! This intermediate-level class blends yoga, natural movement, trail running and FiTMaT for a dynamic total body workout. This 2-hour outdoor boot camp begins with a grounding yoga flow, coupled with natural movement drills designed to warm up tight muscles and focus the mind. This is followed by a 30 minute trail run and 15 minute natural movement sequence combining ground work such as: balancing, carrying, crawling, jumping and tumbling. We finish in the pool with a 45 minute BOGAFusion sequence. Have you ever just wanted to be a kid again, skip the line and have an Olympic size pool all to yourself? Grab your favorite pool float, your BFFs and unwind after a long week. Join us for our Friday Night Float from 7-9PM at North Park Pool. Admission includes a 30-minute floating FITMaT Session, Exclusive Access to the Floating Obstacle Course and entry into the float races! There may even be prizes...Adults 21 years of age or older. Registration required. Take a journey away from the hustle and bustle of hectic urban life, into a world of rejuvenation and respite. The New Moon Zen Float combines yin and restorative movements performed on floating BOGA FiTMATs. The gentle and therapeutic nature of the Zen Float practice, coupled with the soothing effects of water on the central nervous system, make it a perfect time to engage the self in mind, body and spirit. Most think of floating yoga as a fun way to test your balance and challenge your yoga practice, but imagine doing your meditation, breathwork and asana practice while floating on gentle waves. This non-intimidating #ZenFloat will provide participants with quality instructions on basic water awareness and modified yoga poses to efficiently enhance their comfort on the water. If yoga on a floating mat seems intimidating, this class will be the perfect introduction, as most poses are seated, supine or prone and done while floating over therapeutic temp waters. Our Zen Float class consists of a floating yoga sequence that emphasizes relaxation, meditation, and lengthening the connective tissues of the body. Persons with aches and pains float for relief. Every muscle is able to fully rest and recover. Some float to strengthen their mental edge and to relax tight muscles. Athletes have found that doing #Zen Float in conjunction with a regular training program has improved their athletic performance. Floating yoga can help to aid in preventing sports injuries and shorten recovery time. Those who tend to have swollen or tired feet from standing all day float to reduce swelling and restore. Others with chronic issues practice in order to preserve muscle mass and maintain strength. Join us for a safe & effective way to increase range of motion, mobility & balance, & to reduce pain. Girls/Guys Night Out! Bachelorette Parties! Corporate Team Building! Book the ultimate private party package! Have the time of your life, having fun making memories on your special day with 12 of your besties! 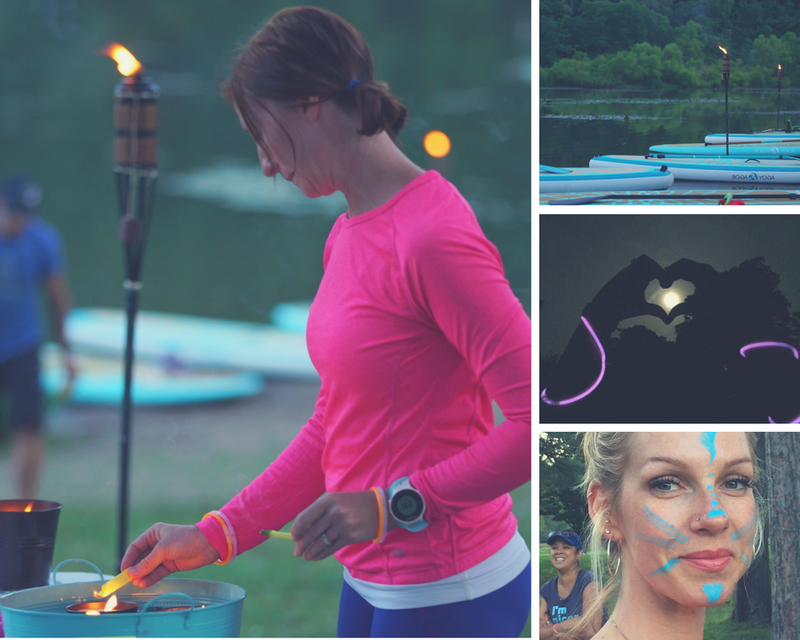 This 2.5 hour package includes: 1.5 Hour FiTMAT or Stand Up Paddleboard (SUP) Session including photos and refreshments. $50 per person, 12 person maximum party size. $75 non-refundable deposit due on date of booking. Call to schedule 724-554-0712 or email us! Learn everything you need to know to get started in the exciting sport of Stand Up Paddleboarding. SUP offers a great total body workout and is a great activity for lakes, rivers and the ocean. In this class you'll learn the proper stance for balance and control, essential paddle strokes and turning techniques, as well as how to choose the right board and paddle. Courses will be held on protected water, and no experience is necessary. Come with us to learn this hybrid of surfing and paddling and find out how to walk on water! Leave the comfort of your mat on shore and step into the beauty of an outdoor floating studio. This class is designed to introduce students to the unique practice of SUP Yoga. We will take time to become acquainted with the board by learning how to align your body to evenly distribute weight and create balance. The floating studio provides the perfect setting to let go of the monkey mind and be fully present in the moment. (If you are not fully present, you are in the water.) After a short meditation and gentle stretching we will heat things up with sun salutations and a progressive practice where you can challenge yourself and redefine body awareness on an unstable foundation. There will be plenty of play time to test out your favorite poses on the water. Be prepared to laugh, have fun and test the waters! Join us for a sunrise paddle tour of North Park Lake and welcome the new day. As the mist rises off the water, we launch from the Gold Star Shelter boat launch and paddle to the Boat House and back. If we are lucky the Blue Heron will grace us with his beauty and glide across the water as the sun pops over the horizon. Grab a cup of coffee and enjoy a sunrise paddle board tour with PuppyLove SUP + Yoga to jumpstart your day. This all levels practice will take place at the magical time when the sun sets and the moon rises. During the full moon, energy is powerful and intense. It represents the feminine, emotional, creative and nurturing aspects of our lives and creates a surge that enables you to take action on your intentions. Her energy makes for the perfect time to release something that no longer serves you and manifest your dreams into reality. Take part in a sacred cleansing ritual and discover the beauty of nature at night during this mystical yoga class under the glow of the moon. You will be guided through “SUP moon salutations”, a sweet evening yoga practice and a floating meditation as the moonlight dances around you. The glow of the full moon enhances the beauty of these secluded waters and creates a truly memorable experience. Prerequisite note: Participants should have participated in daylight SUP Yoga classes or should have prior experience with stand up paddleboarding and paddleboard yoga. Want to get your furry friend out on the water? 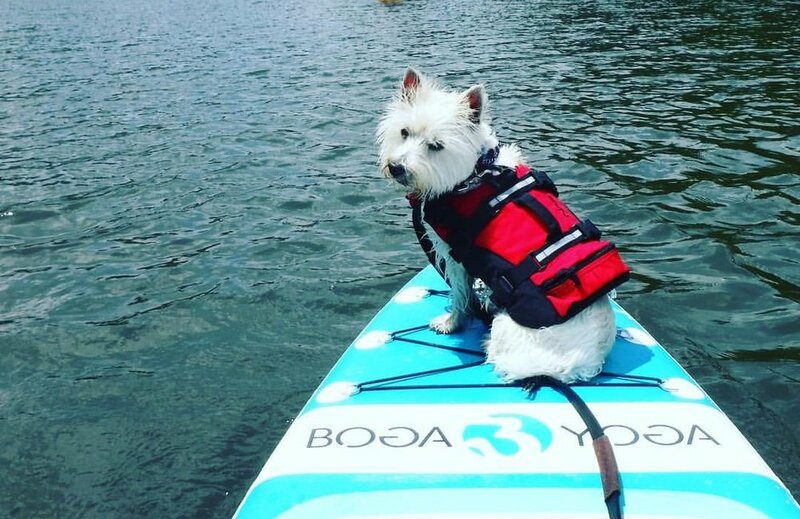 This program will get your dog comfortable with the equipment, allow them to practice getting on and off a paddle board or includes our staff assisting you onto the water, as well as accompanying you to ensure your experience is safe and fun. We encourage you to bring treats that you know your dog likes – food and or toys. Previous paddle boarding experience required. We offer a very thorough training process designed to reduce anxiety, and prepare both pet and owner a successful experience, and the confidence to do it on their own. Pets are often nervous about this new experience, which in most instances ensures that they sit still. There can be many scenarios for how your dog reacts, including going for a swim! The instructor and launch staff are experienced and will help to respond to whatever happens. Keep and open mind, don't be afraid to get wet and let us help you find a new adventure for your furry friend. Limit one pet per paddleboard. Owners must provide an approved pet PFD. Practice YOGA in the pool using water as support and resistance. This fun filled practice is for everyone and is especially great for those with balance challenges and joint conditions. While providing participants a full body workout, this unique class will develop strength and flexibility. An in-water deep stretch will bring you into a state of total bliss before settling down for a sweet sunny savasana. Note: no yoga experience is required.